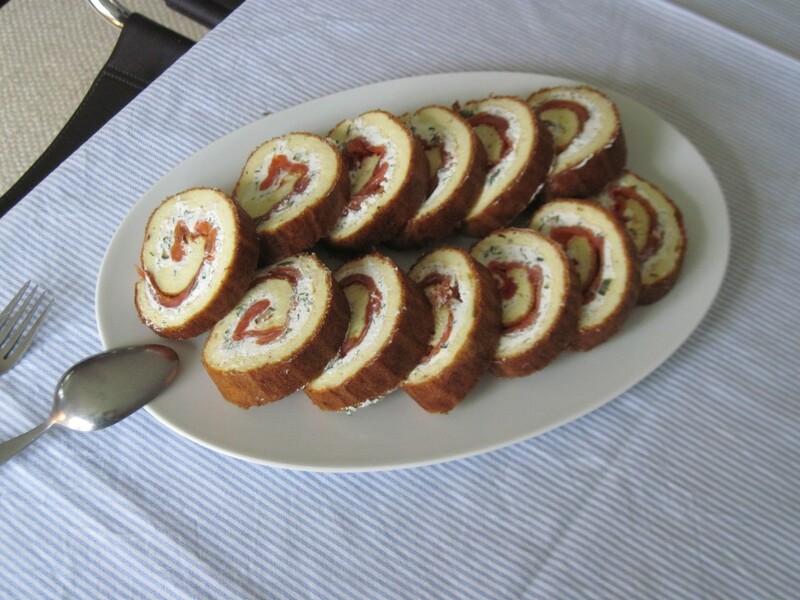 This flat soufflé is rolled like a jelly roll. Make the day before to allow the flavors to mellow and to make cutting easier. 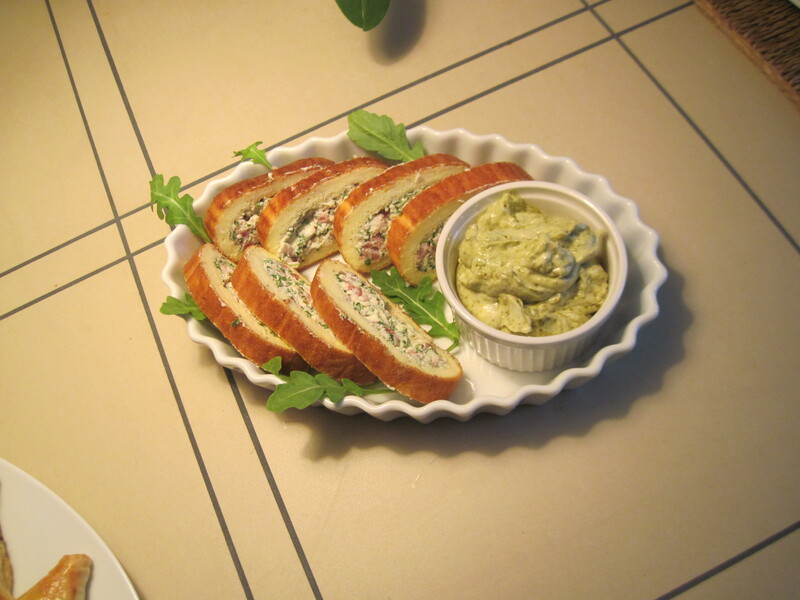 Do not forget the pesto at the end – i did with my first attempt and had to salve it with a bowl of pesto-mayo..! Also, you may choose the same process but other flavours (see the salmon proposal illustrated below). These components will produce a generous serving for 6 people as an appetizer, or 12 as a part of the cold buffet. 150 g grated ricotta salata or pecorino, must be finely grated! 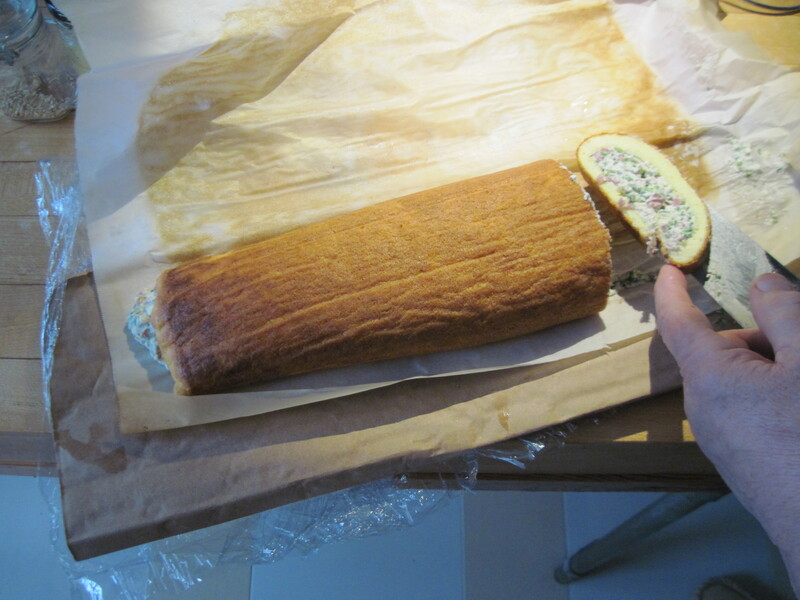 Line an 25 x 38 cm flat (jelly roll) pan with parchment paper. Remove from heat and stir in 30g (half of the original amount) flour. Return to heat and cook for one minute. Bring to boil, stirring. It will thicken considerably. Remove from heat and season well with salt and pepper. In a large bowl, beat egg whites until stiff but not dry. Sift remaining flour over egg yolk mixture. Quickly fold egg whites into egg yolk mixture, incorporating the flour. Pour into prepared jelly roll pan and smooth top. Bake at 375 F for 20 to 22 minutes or until golden and firm. Turn out onto clean tea towel lined with parchment paper. Carefully roll up in tea towel and let cool. Combine ricotta cheese, yogurt, whipping cream, ricotta salata, prosciutto, and arugula in food processor, and mix until still chunky but soft and spreadable. If needed, season with salt to taste. Spread pesto evenly over it. Spread filling evenly over the pesto. Roll up and place seam side down on platter. Slice into 7 mm thick slices. Arrange on platter. Serve with fresh salad or pea shoots or other sprouts for garnish. This entry was posted in Omlets and friends and tagged cold buffet, lunch, śniadanie. Bookmark the permalink.